Hi, when gnome mplayer suddenly stopped working I uninstalled/reinstalled it with pamac. I still cannot play any sound file, so i wanted to install mplayer but there are multiple file conflicts. I need to remove ALL files linked to mplayer and gnome player in order to install one of the two players from scratch. None of the two being listed as installed in pamac I cannot uninstall them from there. I cannot find instructions on how to completely remove a program with all its files/dependencies in a terminal. Maybe someone can help me please? find all files belongs to a package? gives “Impossible to find target”. In pamac, both players are NOT installed. When I try to install one or the other, I get the endless error list below. Once again: I did not uninstall any of the players, they just stopped working one day, after working well for years. gts is dependency second level, but seems also nt berecognized by pacman as installed ? ls /var/lib/pacman/local is giving out packages names? OK, I try the database repair. What does this mean, practically: “Create the log filter script and make it executable.” What do I do exactly…? Sorry for being such a noob. @joekamprad @judd Thank you very much. I was able to install Parole (multimedia player), and it works. If I want to remove what is left of mplayer and gnome-mplayer, can I use pacman -Rsn to remove everything including dependencies? 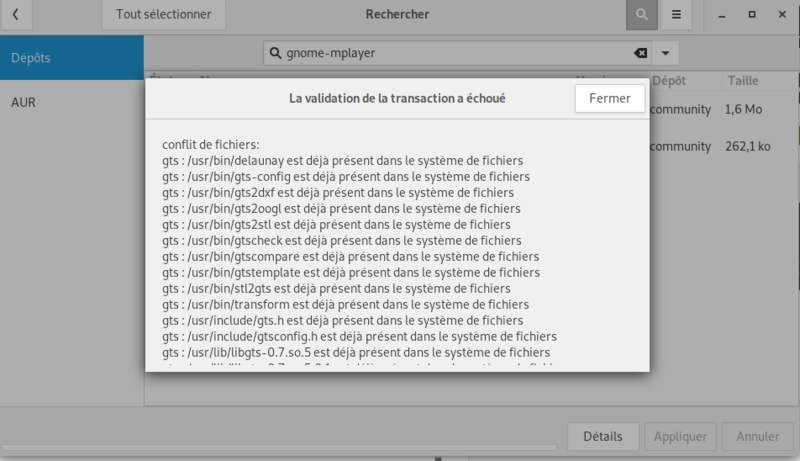 I am asking because I tried but using “mplayer” or “gnome-mplayer” as package name didn’t work: no such target. they are not installed… and you can’t reinstall them because of a depending package called gts. You can remove the files by hand or repair the database. Thx very much for your help and for your patience once more. I will simply save my files and reinstall. I am not confident executing the database repair.